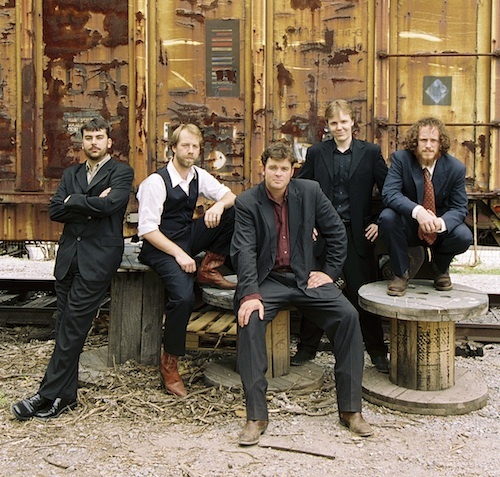 If you've never seen The Steep Canyon Rangers perform live, I highly recommend you do. Their genre? Bluegrass at it's finest and with over 10 years of playing music together, the Rangers not only know how to play and sing, they know how to entertain and put on a great show of all original acoustic music. 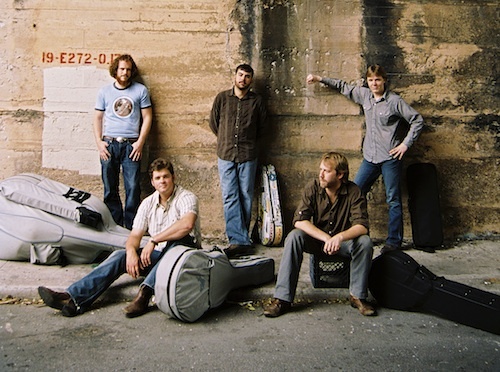 Shown in the photo above standing left to right, the members of the group are: Charles Humphrey III (bass), Mike Guggino (mandolin), Woody Platt (guitar), Nicky Sanders (fiddle), and Graham Sharp (banjo). The following is taken from a 20 minute phone interview with Woody from their home base in North Carolina. Woody Platt: Well I messed around with the guitar a little bit as a kid just learning chords but I wouldn't say I started playing it with any sort of seriousness until I was a sophomore in college. Bronson: Were you self taught or did you have teachers? Woody Platt: I was self taught for a while. We were all in the band living in Chapel Hill, NC, and I was turned on to this Bluegrass instructor out in Chatham County, which is a county outside of Orange County where Chapel Hill is so I just took some bluegrass guitar lessons but other then that basically self taught. Bronson: You started the band in what year? Woody Platt: Right around 2000. Bronson: And you guys just started picking together at college in Chapel Hill? Woody Platt: Graham Sharp, our banjo player, and Charles Humphrey, our bass player and myself, we were just college buddies for several years and then Graham got a banjo and Charles got a bass. The next thing you know we're playing music. Instead of just hanging out, we're hanging out playing music. It just kind of unfolded real naturally. Bronson: So you all finished school and then you started touring? 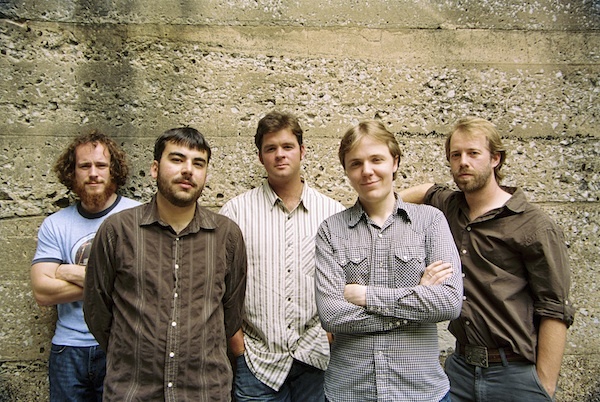 Woody Platt: Yeah, we started gigging our senior year, just around town in Chapel Hill just for fun, and when we finished school, we all graduated '99, 2000, the band was pretty much going and we decided to move in together in Asheville and see if we could make a run at playing more shows. We were really having a good time. It was so fun, we wanted to give it a shot and as it is we stayed the course. It worked out well. Bronson: You've had a wild last couple of years, you guys are all over the world. Woody Platt: We were having a good run anyway, we were getting a lot good bookings, enjoying ourselves, proud of what we were doing and making records. We felt like everything was on a good pace and then we got hooked up with Steve Martin a couple of years ago and it's kinda added a new aspect and some real excitement to the whole thing. Bronson: Your last album was "Deep In The Shade". That was your 4th album, right? Woody Platt: Yeah, it was. That came out on Rebel Records. We did one record with a label outside of Chapel Hill called Yep Roc Records then we got invited to join Rebel Records which was a big honor because they're a real respected Bluegrass label, and yeah so "Deep In The Shade" is our latest record. 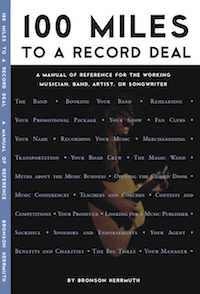 Bronson: Have you just went into the studio with Rounder (Records)? Woody Platt: We went into the studio with Steve and did a record for Rounder which comes out March 15th, next week, called "Rare Bird Alert" and that's a Rounder release and then we are in the process of finalizing our contract for a solo project with Rounder to be recorded this fall. 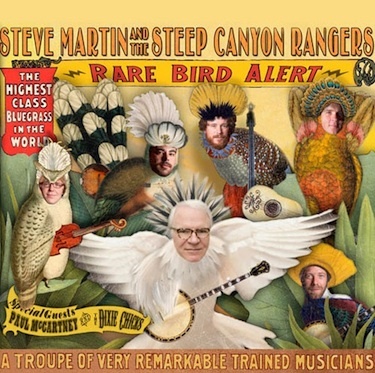 Bronson: When I saw that album cover on your web site for "Rare Bird Alert", it really, really, really, made me wish they still made albums. Woody Platt: Well that particular record is coming out on vinyl. Bronson: That's awesome 'cause that cover is great. Woody Platt: I know. Our "Deep In The Shade" is out on vinyl as well. Bronson: So you've got some big shows coming up here real quick. You're getting ready to go to New York to do Late Night with David Letterman, The View, The Colbert Report? Woody Platt: Yes, all that stuff is just a real treat. Working with Steve is already a treat and then the TV shows, such a wonderful tool to promote a record and for a band like us to get exposure and experience that we don't normally get. We might deserve to get it but we just don't normally get that level of exposure so yeah, it's exciting. It's real exciting. Bronson: You're an acoustic band. When you go on TV do you find that a whole different environment? Woody Platt: You know except for people that do it all the time, it's just a new experience all the way around. Lot's more people involved. There is a lot more nerves 'cause usually it's live and you get one shot at it you know, it's not your whole show. We've done well with it, just being confident in who we are and what we do, and Steve gets most of the attention so we just gotta do our part. Play the music, sing the songs, and it's pretty special. Bronson: How do you feel about when you were touring overseas, do you like playing over there? Woody Platt: Yeah, I love it, we've done a lot, the Rangers. We've done Sweden, Ireland, Germany, on our own and then we've done London with Steve. It's very well received over there and it's nice to share a music like Bluegrass which is purely American music. It's fun to take that and tour that, to put that out there. Bronson: Did you do any street playing, did you do any busking when you were over there? Did you get out on the street? Woody Platt: Not really, when we were in Germany it was like 18 shows in 20 days and when we were in Sweden it was just one festival. We were just kinda in and out so not a lot of free time to kick around and do some other stuff. We just basically stayed the course. Bronson: The other night, watching your show as you guys were talking about your songs, it kinda seems like you all share in the writing? Woody Platt: We do. Our main songwriters are Graham and Charles, our banjo and our bass player, but we have a real democratic process of songwriting which is really nice. They both bring songs to the band and then we take turns. We just work up every idea on paper, so we sit down and talk about it. It's a really neat process. They're definitely the songwriters but they don't show up with an egoistical approach to it. They're not like "Do my song. Here's how you're gonna play it." They're like, "What do you think? What should we change? Is this the right key? Do you like this, do you like that?" I think that develops a group identity around each tune that makes it the bands. It really defines our sound, everybody gets their input. Bronson: You do a lot of the lead singing. Have you had any training or is that just your natural voice? Woody Platt: I've never had any training. When I was a kid I sang in the glee choir because I liked it, which I don't know how I got involved with that as a kid when I ran into Charles and when we started playing music, by default, I just kinda knew a few folk songs and a few bluegrass songs that I was willing to try and I did. Everyone else found their parts around that and that's what we did. Bronson: The way you move around on each other's mics. That's so fluid, you guys have it down. You got that from the old touring acts, the old Bluegrass bands? Woody Platt: Yes and no. We like the one mic singing, I don't know why. That's what we got from some of the bands that sang around one mic in the early days of Bluegrass. Then we quickly realized that you could get the vocals but you couldn't get the instruments as well. We wanted to have that presence because Bluegrass is already quiet enough 'cause it's acoustic, so we wanted to have that presence so we flaired the mics out and that immediately created that motion. You know it's like alright, well I've got to stand over here to play rhythm guitar, now I've got to come over here to sing and Graham's gotta stand over there to play banjo but then he's gonna come over here to sing a trio and that created movement, then we started thinking about the back up and how you keep that in there. So it was a natural process once we realized we wanted to sing around one mic but we wanted the instruments to be present also. Bronson: You mentioned touring with Steve Martin and I've seen Steve talk about ya'll and he thinks real highly of you. Do you get to spend some time away from the limelight? You get to hang out with him? Woody Platt: Yeah, he's such a great person you know, just a great person and a great hang and we're lucky. Just that experience, to be around someone with his experience as an entertainer and his knowledge of the business and also his unique musical skills are startlingly good, he's really good. When we finish this interview I'm heading up the mountain to rehearse with him for the rest of today and then tomorrow before we all go to New York. It's just fun. He likes to socialize, he likes to have dinner parties with us. It's important I think, anybody that you play music with to have a relationship outside of the music. I think it connects you in a deeper way. It's fun to have a musical relationship, it's also fun to be friends. I think that comes through in your music when you're truly having fun. Bronson: You've been going for it a long time. I know in 2006, the International Bluegrass Music Association (IEBA) called you the Best New Emerging Artist, and now we're sitting in 2011. Kind of shows you how long it takes sometimes even when you're working hard. Have you got any advice for other bands out there that are trying to get their music heard? Woody Platt: I think the most important thing is try to find a band and a group of friends. Try to let a friendship bring you together and not necessarily like who's the best at what. There's a million guitar players better then me, a million singers better then me and you can say that about each of our band members, but we put it together as friends in our musical puzzle. I think another important thing to think about is trying to get a band that everybody comes in with the same goals and interests so you can stay together. You know Bluegrass suffers from the band shuffle. Everybody going to different bands all the time so the sound can't develop within each band, so I think it's really important to find people that you're compatible with for the long run that you can communicate with and share the same goals and interests. Bronson: The other night when you broke that guitar string, I've never seen anyone change a guitar string that fast. Woody Platt: (laughing) Well I've had a lot of experience changing guitar strings. If you didn't notice I'm a pretty big person and I tend to have a heavy hand on the guitar. I think what I lack in dexterity I gain in just maybe some power, playing too hard. I break a lot of strings so I'm ready, I have one in my hip pocket ready to go. It just happened on the first number the other night. If it's early enough in the song I can just whip it off and get the other one back on in time to join back in on the song. That was a pretty seamless string change. Bronson: I've been playing for money since I was 7 and I'm 54 and I have never seen anyone change a string that fast and that's a lot of pickers. I was very impressed. The guys even were 'cause one of them even said something and I think you got a round of applause for it, didn't you? Woody Platt: (laughing) Yeah, usually. If you get back into the same song you're guaranteed to getting a round of applause. The worst is when you pull out of a song, 'cause the song suffers when you take the instrument out of it. The worst is to pull out of a song and then not be able to get back into that song. You should of just stayed in with the broken string so it's always a risk when you jump back and start doing something during the set. You gotta get back in or it doesn't serve it's purpose. Bronson: Well you guys have an awesome band man. I'd seen you on TV, that was the first time I'd ever experienced you live and you just blew me away and everybody that was there. I really congratulate you guys. You've obviously worked hard and you're earnin' it and that's awesome. I know you're really busy and I appreciate you doing this interview. Woody Platt: Hey it's my pleasure. I appreciate your excitement about our band. We'll keep doing it and we'll see you again down the road somewhere. Bronson: Thank you very much Woody. Woody Platt: Thanks Bronson, I really appreciate it. 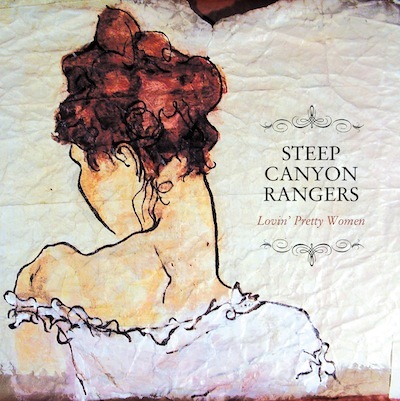 Visit The Steep Canyon Rangers at their web site.